Planting pollinator-friendly flowers on its own does not seem to be enough. To give maximum benefit to pollinating insects you need to provide a habitat that is conducive to them. For most pollinators this seems to be close and varied planting that resembles the hedgerows and sunny meadows that are their original home. You can easily provide this using flowering plants and shrubs. Your garden definitely does not need to look like a wilderness or be full of coarse weeds. The nature-friendly approach to gardening requires a lighter touch, but your garden should still be beautiful and colourful. The illustration on the left demonstrates this point. It shows one of our garden borders. The red daisy in the foreground is Gaillardia (Blanket Flower), a great favourite with bumblebees. 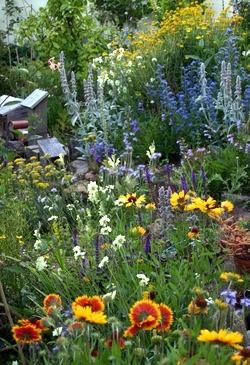 Below is a short checklist for nature-friendly gardens. These suggestions are not a dogma, simply good practices that you can aim towards as your garden develops and evolves. 1. There is no need to cut everything down in autumn. Just cut away dead stems that block paths, and remove slippery piles of leaves from lawns and paths. Leave what you can until early March. This is because many beneficial insects overwinter in dead stems or seedheads, or among leaf litter on the ground, and wild birds find food there. 2. Concentrate on planting 'single' flowers (i.e. those where stamens are visible). 'Double' flowers (i.e. those where stamens are replaced by rows of petals) tend to have little value as sources of pollen or nectar. Bedding plants and other highly-hybridised types of garden flowers (i.e. most of what is sold in garden centres) often have modified flowers that don't produce much in the way of pollen or nectar. Pretty to the human eye, but useless for insects. An easy rule-of-thumb is to select those which you see actually being visited by bees or butterflies in the nursery or garden centre. 3. Choose plants purposefully, rather than on impulse. Ask yourself: 'will this plant provide pollen or nectar for insects, or ground cover for amphibians and beetles, or berries or dense cover for birds?' If the answer is 'no', choose something else. There are thousands of other plants to choose from. See my fact sheets for some simple lists of wildlife-friendly plants. 5. Cut down on digging. That's good news for your back! Apart from your vegetable patch, the soil does not benefit from constantly being turned, because it is an underground world of millions of micro-organisms of many kinds all inter-relating with each other, cycling nutrients and forming a natural balance. In particular, mycorrhiza (beneficial underground fungi that connect the roots of different plants and help them to take up nutrients) may be damaged by digging. If your soil is properly furnished with ground cover plants it's impossible to dig it anyway. 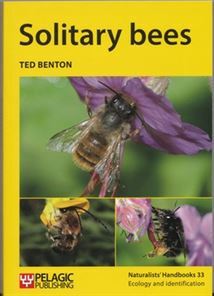 Just leave a few patches of bare soil in a sunny spot for Mining Bees. Keep these patches clear, hand weed them if necessary. 6. Feeding of flower borders is largely unnecessary. Everything tends to settle down and in time and forms a self-sustaining community. Newly-planted shrubs, fruit bushes and young trees will benefit from your home-made compost or an organic fertiliser forked into the soil when you plant them. Otherwise use your compost on your vegetable patch. 7. Do not use insecticides at all; they are really bad news for all kinds of wildlife. In time, a natural balance between pest and predator tends to develop, and plagues of pest species will rarely be a problem. You can live with a bit of damage. Just be patient. 8. Do not use non-organic slug pellets; they are also really bad news for wildlife. Hostas, Delphiniums and Lupins seem to be magnets for molluscs and I suggest you avoid growing them. If your lettuce seedlings are being munched, use beer traps or organic slug pellets as a temporary measure but target their use to a restricted area and clear away the dead slugs and snails daily so that birds, toads and Slow Worms will not eat them.